There is no LabVIEW 2018 (... there might be in the future if we look at the typical release history of LabVIEW versions). What "task bar" are you talking about? Typically you can install everything in evaluation mode and activate later after you have found the serial number. Where did you get the LabVIEW from? NI Software for FRC 2018 is not available till kickoff. 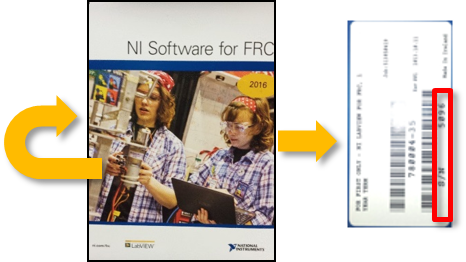 However you can download NI Software for FRC 2017 and use your serial number from you Kit of Parts from last season, or run in evaluation mode (as altenbach referenced) till you get your Kit of Parts for this season. This is detailed in the installation guide below. I got LabVIEW from this site. It is the 2017 version. Where can I find the serial code for this version? I have tried to install the program in evaluation mode to no avail. There is no LabVIEW 2018 (... at least not yet if we look at the typical release history of LabVIEW versions). The serial number is only going to come in the Kit of Parts (KoP) for each year as mentioned in the link that I posted last. Here's a screen shot of the envelope that comes in the KoP where you find the S/N to activate. Team 5430 is having a problem. . When we try to activate the software it shows outlined in red, and is rejected. We are installing in evaluation mode and have extended the evaluation. We need a functional serial number. I would recommend you to get in contact with National Instruments if you're sure the Serial Number is the one received for the 2018 season, as well as that your software is the correct version (2017), and there's nothing blocking the NI products to connect to the activation server (firewall, admin priviledged, etc). Feel free to call 866-511-6285 from 1 - 7 PM CST, Mon-Fri. I also encourage you to avoid posting your assigned Serial Number in these public forums, as each team has its own different code. How didi you solve it? I'm with the same problem, I'm from Brazil and called to NI Brazil and i'm waiting for their answer. Have you reached out to NI yet? I think that would be our best course of action since this is kinda of a corner case that would be best to be figured out on the phone.